BHP announce two gas discoveries offshore Trinidad and Tobago. 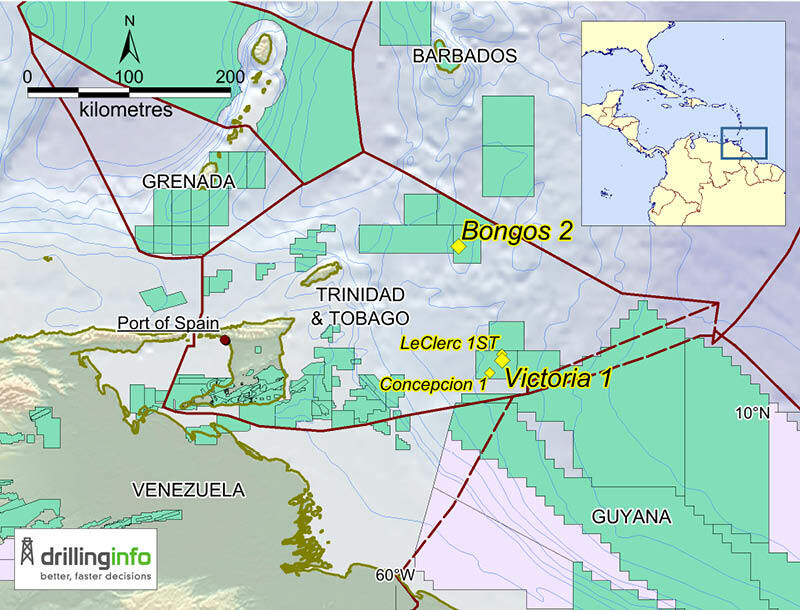 Map showing the location of the two gas discoveries offshore Trinidad & Tobago. Drillinginfo. On 18 July 2018, BHP reported that the Victoria-1 NFW in Trinidad and Tobago’s TTDAA 5 Block encountered gas. The company revealed the news in its operational review for the financial year, which ended on 30 June 2018. The well reached a final TD of 3,282m and it forms part of the company’s Phase 2 deepwater exploration drilling campaign, aimed at assessing the commercial potential of the Magellan play. The well was drilled in a water depth of 1,828m and was targeting gas in Pleistocene/Pliocene-age rocks. BHP holds 65% operated interest in TTDAA 5 and Shell holds the remainder. Transocean’s Deepwater Invictus drillship spudded the Victoria-1 well on 12 June 2018 in a water depth of 1,828m, around 3.2 km south of the LeClerc 1ST gas discovery in the northeast of the block, drilled as part of the Phase 1 drilling programme in 2016. It was plugged and abandoned at a TD of 3,282m on 18 July 2018 and the drillship subsequently moved to the Bongos-1 well location in TTDAA-14, in order to drill the second well in the Phase 2 drilling programme. Bongos-1 NFW, located in water of 1,910m, was planned to be drilled to a TD of 5,351m, targeting a Pliocene/Miocene gas play, but it experienced mechanical issues shortly after spudding. Bongos-2 spudded two days later on 22 July 2018, approximately 60m north-east of the original well. Unconfirmed industry sources report that it found three gas pay zones and BHP said in its Q3 2018 operational review that the NFW was plugged and abandoned after reaching a TD of 5,151m and encountering hydrocarbons. A vertical seismic profile may also have been included at the Bongos-2 well location, which is in the western portion of the TTDAA-14 Block. BHP holds operatorship of TTDAA-14 with 70% WI with BP holding the remaining 30% WI. The third and remaining well in the Phase 2 programme, the Concepcion-1 NFW, planned to further test the Magellan gas play, is due to be drilled in the 2019 financial year in TTDAA 5, not far from Victoria and LeClerc. Brazil is emerging as a top player out of the biggest hydrocarbon producing countries of 2018 following confirmation that the pre-salt Campos & Santos basins may contain as much as 100 Bb of recoverable oil.